Periodic tables are always popular, but I think one of the smartest is Cam Wilde's Periodic Table of Typefaces, representing 100 of the most "popular, influential, and notorious" of the world's typefaces ranked by popularity and grouped by class. Download a high res version for yourself in English, Spanish, or Portuguese. Or head over here to order a few different prints, get desktop wallpaper, or purchase wall decals in various colors from Scribble On Everything. Thanks for the link, CaLynn! This is perfection! Company just moved to a new office and I'm totally getting print for our empty walls! LOL! Love it! I can't believe Arial isn't on there, though! Awesome. That said, MY favorite periodic table was the elephant one. It's pretty awesome! The table has elephants with pictures to help remind you of the name. It's great for memorization! This is fabulous. I ordered one to hang by my confuser so I can grab a font at a glance. Perfect! Thanks for the link. Being a typeface freak, I absolutely love this! Oh I love this! Now I know just what to get my sister for her birthday!!! Type + geek chic = love it! This is so cool!! !Thanks for sharing! I love reading your blog... You post the neatest things! I'll admit I'm a typography geek. (I wish they had these wall decals back in my college days). It's really cool how you can make a boring message look exciting with the right typeface. Thanks for posting ! Thanks for the kind write up! In response to saraink's comment, Arial didn't make the cut I suspect because it is ultimately a copied and slightly modified Helvetica (see #1 on the Periodic Table of Typefaces). Rumor is that Microsoft didn't want to pay the licensing fee to include Helvetica in Windows and Microsoft software so they contracted a "re-design" (a knock-off really) of Helvetica. So basically, Arial is the unloved stepchild of Helvetica designed only to save some cash (again, that's the rumor at least). Completely love this! Type geeks unite! My daughter will love this! Thanks! 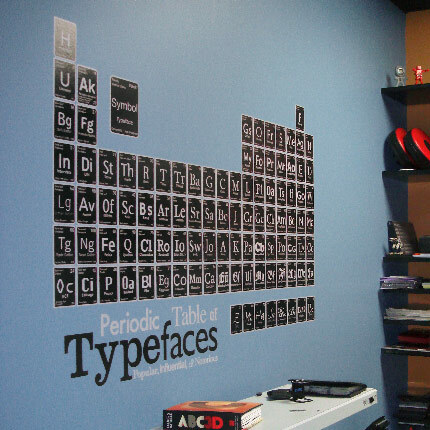 Two things I adore: typography and periodic tables. Oh, and fabric, but fabric wasn't part of your post. However...I just bought fabric in Minnesota that is a periodic table of "emotions." Trying to figure out something clever to do with it. Any ideas? This will make my life so much easier - I'm forever scanning through the fonts trying to get the right one. Thanks again for sharing. Thanks for make us part of the post too. We're happy Cam let us produce the decals and prints for him.